I would normally crop or resize a photo, but wanted to keep this one full size so you could get an idea of the many little details it holds. This is taken in the Shenandoah Valley in 1862. (click photo for closer view). Several things pop out at me. One, this is early war as evidenced by the tentage. The tall canonical tents are called Sibley tents, designed by a regular army Colonel by the name of Henry Hopkins Sibley in 1856 . Sibley would resign his commission and be commissioned a Brigadier General of Volunteers in the Confederacy and lead a failed invasion of the New Mexico territory. The Sibley tent was a mainstay of the Federal Army until the introduction of the shelter half, a canvass sheet that could be combined with two others to form a low lying pup or dog tent and would save on much needed transportation space. Another interesting note is the Trooper at the lower right corner with his single shot carbine resting on the ground. Carbines were issued primarily to the cavalry arm for their portability but were not accurate or as powerful as a single shot musket, so cavalry typically fought dismounted and acted as pickets and skirmishers where they’re mobility could come to bare. Cavalry also did not fight in tight formation as the short barreled carbines did not allow for two ranks with the rear rank firing of the right shoulder of the front. The square tents are called Wall Tents, an obvious descriptive point in that the tent was constructed like a little house. These were usually officer or quartermaster tents. Enlisted men slept in the Sibley tents. There are several lean to’s visible, constructed of just two canvass halves, but these are too big to be the smaller shelter halves that would later see exclusive use in all branches of the army. Each enlisted man would carry they’re own shelter half further reducing transportation space. 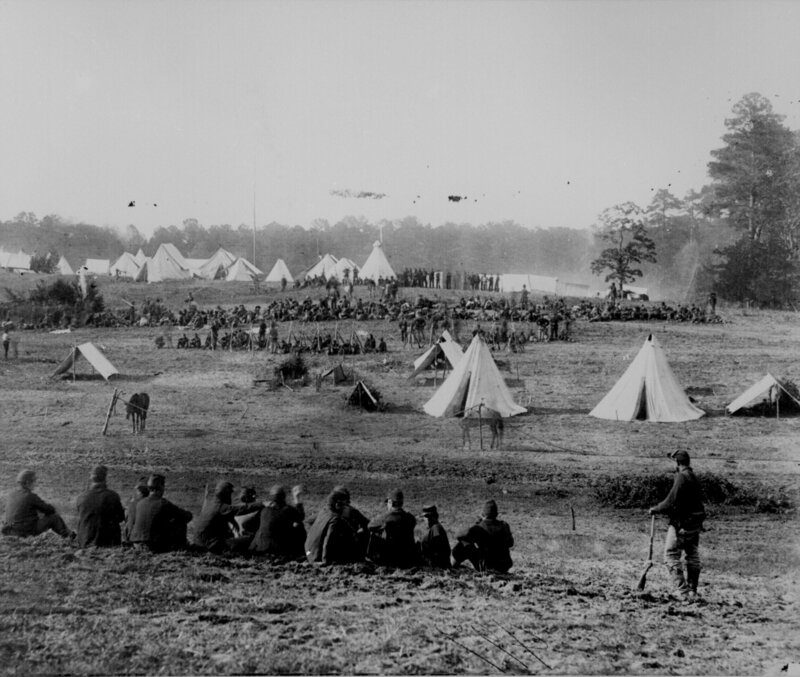 In front of the long line of men in the background are another group of Union soldiers with their rifles in a stack. This teepee like structure is the default method of releasing ones rifle when not on individual slewing arrangements or on picket and camp guard. Whenever soldiers are at rest, as these are, the rifles are stacked so that three muskets with fixed bayonets intertwine the angles of the bayonet into a free standing structure that the leathers and other gear are then draped over. The last thing is the old infantryman’s mantra: why stand when you can sit, why sit when you can lie down, why lie down when you can sleep. Nice job interpreting this photo. Thanks! Great, I’m glad you liked it.